In this exclusive interview, hip-hop artist Brother Ali talks to YES! about the personal transformations that have shaped his life and lyrics. Photo courtesy of Rhymesayers Entertainment. 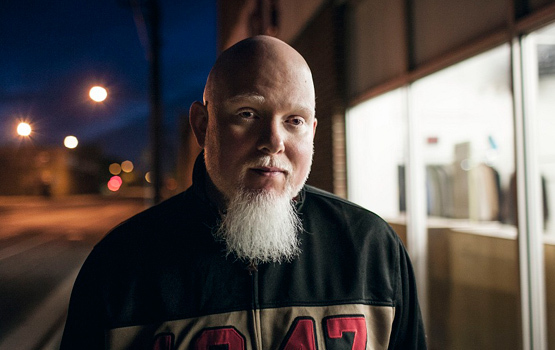 Brother Ali is a politically outspoken hip-hop artist from Minnesota whose latest album, Mourning in America and Dreaming in Color, rocks between despair and acceptance, anger and hope. His clear lyrics often beat a slow, sauntering rhythm, and his sharp critiques of American society are warmed by strains of soul, funk, and sampled historical recordings. Legally blind and shuffled from city to city as a child, Brother Ali started rapping at age eight and used his gift to fit in and make a name for himself when he arrived at a new school. He started recording his music at 13, converted to Islam at 15, and got married at 17. As he grew older he became increasingly political. His single “Uncle Sam Goddamn,” released in 2007 during the U.S. invasions of Iraq and Afghanistan, was a bitter critique of what he called a “billion-dollar-a-week kill-brown-people habit.” As the video went viral, the U.S. Department of Homeland Security froze a money transfer to his record label, and Ali says mobile network operator Verizon removed him from a scheduled tour they were sponsoring. In 2012, he was one of 37 protestors arrested while occupying a Minneapolis family’s home to fight against its foreclosure. Now 35 and the father of two, Brother Ali uses his music and celebrity as platforms to speak frankly about class and racial privilege, and about finding the courage to confront injustice. This entry was posted in Interviews and tagged Brother Ali, hip-hop, Mourning in America and Dreaming in Color, Rhymesayers Entertainment. Bookmark the permalink. ← The “People’s Bailout” Was Just the Beginning: What’s Next for Strike Debt?